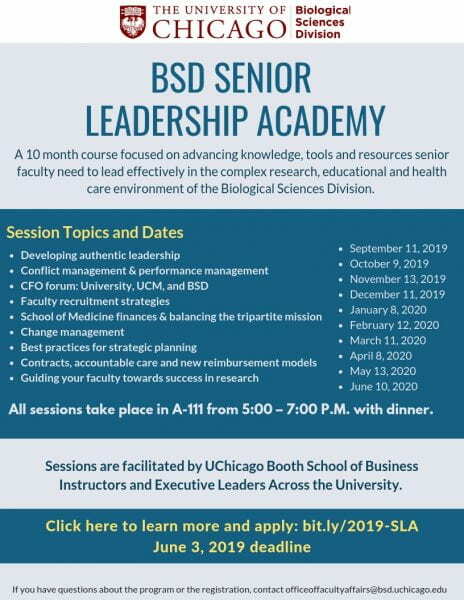 The Biological Sciences Division has established a Senior Leadership Academy for senior faculty leaders ready to commit to a 10 month course dedicated to advancing professional and personal skills required to lead and manage in today’s complex academic, research and health care environment. The goal of this program is to equip senior faculty leaders including chairs and section chiefs with the knowledge, tools and resources to lead within our departments and division over the coming years. Faculty will complete an institutional project as part of the course. Sessions are facilitated by both UChicago Booth School of Business instructors and Executive Leaders across the University. The cohort will be limited to 20-25 senior faculty. Applications to participate in the program are due on June 3, 2019. Questions about the Senior Leadership Academy may be directed to officeoffacultyaffairs@bsd.uchicago.edu. Monthly sessions will take place on Wednesdays from 5:00 – 7:00 P.M. (including dinner) on the following dates, beginning in September 2019 and will continue through June 2020. Final project presentations will be scheduled in June. Candidates will be selected based on their application and must be able to commit to participate in at least 80% of the monthly sessions. Current BSD faculty leaders including Chairs, Section Chiefs, Vice Chairs and senior departmental, educational, clinical, or research leaders. Emerging leaders at the rank of Associate or full Professor nominated by their department chair as being poised to take on a greater leadership role within the department or BSD. We welcome applications from a diverse group of senior faculty, in particular women and those from underrepresented backgrounds. Application statement outlining your personal leadership goals and what you hope to gain from this program. For those who are not department chairs or section chiefs: A letter of nomination from your department chair or senior institutional leader such as a faculty dean.